This is genuine Swarovski Crystal, which is manufactured in Austria. The size is SS 10 (~3mm) and the colour is Citrine (249). Swarovski crystals are brighter and sparkling when compared to other crystals due to patented manufacturing processes. To produce a diamond-like effect th.. This is genuine Swarovski Crystal, which is manufactured in Austria. The size is SS 10 (~3mm) and the colour is Tangerine (259). Swarovski crystals are brighter and sparkling when compared to other crystals due to patented manufacturing processes. To produce a diamond-like effect .. This is genuine Swarovski Crystal, which is manufactured in Austria. The size is SS 10 (~3mm) and the colour is Rose Peach (262). Swarovski crystals are brighter and sparkling when compared to other crystals due to patented manufacturing processes. To produce a diamond-like effect.. This is genuine Swarovski Crystal, which is manufactured in Austria. The size is SS 10 (~3mm) and the colour is Light Turquoise (263). Swarovski crystals are brighter and sparkling when compared to other crystals due to patented manufacturing processes. To produce a diamond-like e.. This is genuine Swarovski Crystal, which is manufactured in Austria. The size is SS 10 (~3mm) and the colour is Denim Blue (266). Swarovski crystals are brighter and sparkling when compared to other crystals due to patented manufacturing processes. To produce a diamond-like effect.. This is genuine Swarovski Crystal, which is manufactured in Austria. The size is SS 10 (~3mm) and the colour is Purple Velvet (277). Swarovski crystals are brighter and sparkling when compared to other crystals due to patented manufacturing processes. To produce a diamond-like eff.. This is genuine Swarovski Crystal, which is manufactured in Austria. 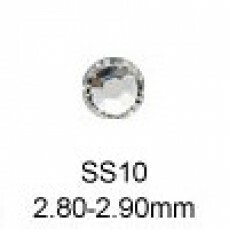 The size is SS 10 (~3mm) and the colour is Jet (280). Swarovski crystals are brighter and sparkling when compared to other crystals due to patented manufacturing processes. To produce a diamond-like effect the crystal glass is p.. This is genuine Swarovski Crystal, which is manufactured in Austria. The size is SS 10 (~3mm) and the colour is Provence Lavender (283). Swarovski crystals are brighter and sparkling when compared to other crystals due to patented manufacturing processes. To produce a diamond-like.. This is genuine Swarovski Crystal, which is manufactured in Austria. The size is SS 10 (~3mm) and the colour is Greige (284). Swarovski crystals are brighter and sparkling when compared to other crystals due to patented manufacturing processes. To produce a diamond-like effect the crys.. This is genuine Swarovski Crystal, which is manufactured in Austria. The size is SS 10 (~3mm) and the colour is Indian Pink (289). Swarovski crystals are brighter and sparkling when compared to other crystals due to patented manufacturing processes. To produce a diamond-like effec.. This is genuine Swarovski Crystal, which is manufactured in Austria. The size is SS 10 (~3mm) and the colour is Fern Green (291). Swarovski crystals are brighter and sparkling when compared to other crystals due to patented manufacturing processes. To produce a diamond-like effect the .. This is genuine Swarovski Crystal, which is manufactured in Austria. The size is SS 10 (~3mm) and the colour is Sunflower (292). Swarovski crystals are brighter and sparkling when compared to other crystals due to patented manufacturing processes. To produce a diamond-like effect ..